History of Celtic Bronze Age Metalwork, Megaliths in Ireland. Following the Stone Age and followed in turn by the Iron Age, the Bronze Age (c.3000-1100 BCE) marked the era in which prehistoric man began mixing copper with tin to produce bronze implements and other precious metalwork of great skill and imagination. It first began around the Mediterranean basin. Copper was first mined in Mesopotamia around 5,000 BCE, but metallurgy did not reach Northern and Western Europe until later. Thus, in Ireland, the "Copper Age" (Chalcolithic era) did not commence until about 2500 BCE and the Bronze Age not until around 2000 BCE. While most of the prehistoric art fashioned by Irish craftsmen was strictly functional, in the form of decorative features added to weapons, cooking utensils, horse-tack, and drinking vessels, the Bronze Age also saw more artistic examples like horn-shaped trumpet, which was featured in the "Dying Gaul" Greek sculpture (c. 230 BCE) by the Greek sculptor Epigonus. 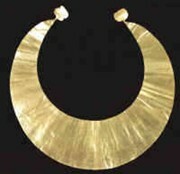 around the Neck (c.2500-1200 BCE). Celtic metalwork underpinned much of the artworks in Ireland during this period. Up to 400 tonnes of copper was mined in the southwest of the country (c.2500-1800 BCE), in County Kerry and Cork, then alloyed with tin brought over from Cornwall in England. 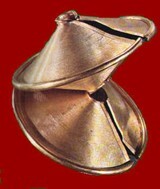 Many bronze items were exported to the Continent from Ireland during this period. As well as bronze artifacts, implements, and other decorative items, Irish craftsmen also developed a range of artworks in gold. Ireland was a relatively rich source of gold ore which stimulated an active cottage industry in this precious metal. This is evidenced not only by the considerable number of gold ornaments and artifacts, dating back to the Bronze Age, which have been unearthed in Ireland, but also by the variety of Irish gold items have been discovered throughout Europe. 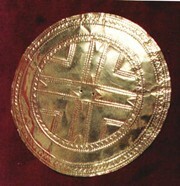 At first, this gold-work comprised mainly simple shapes (like crescents) as well as disks of gold sheet. Later, Irish goldsmiths introduced the more intricate torque (torc) - a collar, with a bar or ribbon of metal, looped and twisted into a screw-shape. In addition to gold torques, Bronze Age workers in Ireland produced a range of earrings and other gold jewellery. Examples include the great Lunala relics, bracelets, ear ornaments and clasps, balls and Torcs. Pottery was also made, but Bronze age earthenware was Beaker ware - a European style of pottery quite unlike the round-bottom type artifacts of the Neolithic period. For the history of the Celts, who arrived in Ireland during the iron age, see: Celtic Culture. For their arts/crafts, see: Celtic art. Tomb-building (eg. Newgrange) - mainly of small wedge tombs - also continued during the Bronze era. A common type was the cist - a coffin or burial chamber made from stone or occasionally a hollowed tree. In Ireland, most cists were made of stone, topped with a larger stone slab and buried a few feet below the surface. The days of the complex passage graves of the Neolithic era were gone for good. Those large tombs still in existence were largely disused, although some were still venerated as holy places. As well as cist burial chambers, many stone circles were constructed at this time, mostly in Munster and Ulster. These monuments coincided with the building of the Stonehenge stone circle in Wiltshire, England, which has been dated back to c.2600 BCE. For more about architectural visual arts during the Bronze Age, see: History of Architecture. Note: For a list of ancient/medieval monuments of architectural, or cultural interest, see: Architectural Monuments Ireland and Archeological Monuments Ireland. In general, the Bronze Age in Ireland witnessed a distinct advance in the culture and civilization of the Irish people. At the very least, the new metals of copper, bronze and gold allowed craftsmen (it is still too early to speak of artists) to create a wider range of beautiful and ornate items. Trade as well as cultural contacts between Ireland and the rest of Europe grew significantly at this time leading to new influences being absorbed in a range of crafts. The history of Irish art is generally deemed to begin with early carvings found at sites such as Newgrange and is then traced through Bronze Age ornamental objects, especially those made in gold.  For more on the history of ancient arts and crafts, see: Homepage.